Place salmon fillet, skin side down, in ungreased 13x9-inch baking dish. In small bowl, mix soy sauce, sesame oil, gingerroot, pepper and garlic; pour over salmon. Cover; refrigerate at least 2 hours to blend flavors. Heat oven to 325°F. 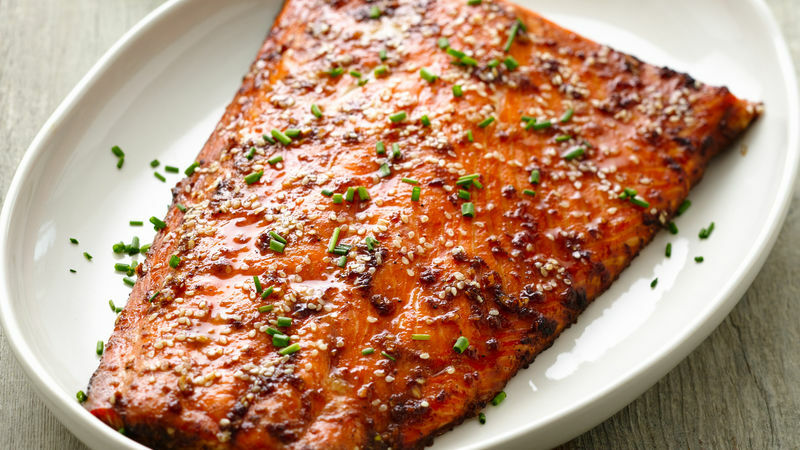 Sprinkle top of salmon with brown sugar and sesame seed. Bake 20 to 25 minutes or until salmon flakes easily with fork. Let stand 5 minutes before slicing. Garnish with chives. Add a gingery flavor to your Asian dinner! Enjoy this salmon coated with soy sauce mixture - a hearty meal.